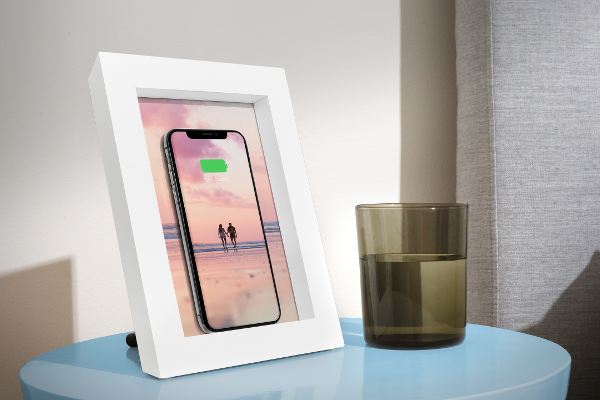 Twelve South launches PowerPic, A photo frame with 10W Qi wireless charger. Twelve South today launches PowerPic, a picture frame that wirelessly charges your phone. PowerPic has a Qi charger hidden inside capable of providing up to 10 watts of fast charging power to your phone. Just set any phone that can be charged wirelessly against the photo to begin charging. PowerPic even works with phone cases up to 3mm thick. The contemporary frame is made of New Zealand Pine and holds any 5" x 7" photo. This wooden picture frame, with a wireless charger hidden inside, naturally blends into your home or office. PowerPic wirelessly charges any Qi-enabled phone, and enables up to 10 watts for wireless fast charging. A small status light on the back of the frame lets you know when your phone is fully charged and alerts you if a foreign object, like a bank card with a chip, is preventing your phone from charging properly. The PowerPic USB cable can be plugged into any USB outlet, computer or phone adapter. Crafted from New Zealand pine, PowerPic holds any 5"x7" photo and fits seamlessly into most any home design. Choose from a white or black frame. PowerPic includes two photos so you can use it right out of the box. Do you protect your expensive phone with a case? No problem. PowerPic will charge through most popular phone cases up to 3mm thick, including Apple iPhone cases and the Twelve South Journal. Twelve South PowerPic is now available to buy at $79.99.